Estimates of the variability that athletes show from competition to competition provide information about the relative contributions of environmental and other factors affecting competitive performance. Smallest and other important thresholds for assessing changes in performance in competitions and field or laboratory tests can also be derived from estimates of variability. 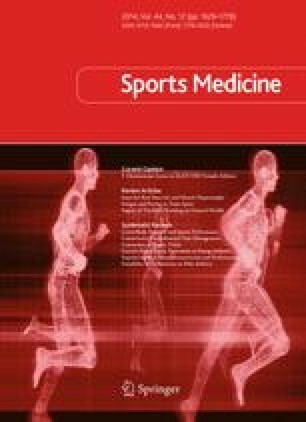 To systematically review estimates of within-athlete variability of competitive performance in various sports. We searched SPORTDiscus and Google Scholar for studies providing estimates of within-athlete variability between competitions. Estimates are reported here as coefficients of variation (CV) only for the best athletes. Some studies also combined within-athlete variability with between-athlete differences into a measure of predictability expressed as an intraclass correlation coefficient, reported here for the full field of competition. Skeleton and 1,000-m speed-skating times have the lowest within-athlete variability (CV of 0.15 % and 0.4 %, respectively), apparently because of the effect of the initial phase of the race on race dynamics. Times in sprint and endurance sports also have relatively low variability (0.6–1.4 %), reflecting the predominant contribution of mean power output to performance. The power-velocity relationship tends to make CV for time smaller in sports performed against water or wind resistance, but this effect is offset by variability in the effects of wind and water on individual athletes. Sports requiring explosive power in a single effort, such as field events and weightlifting, have larger CVs for their performance measures (1.4–3.3 %), likely reflecting substantial contributions of skill. Sports with the greatest within-athlete variability (~50 %) were those with subjective scores (e.g. surfing). Predictability correlations ranged from 0.17 (half-pipe snowboarding) to 0.93 (cross-country skiing). There was little difference in variability or predictability between men and women. Application of power-velocity and power-duration relationships allows transformation of the estimates of within-athlete variability of competitive performance into thresholds for smallest and other important changes in performance in laboratory and field tests of power output. Understanding the contributions of race dynamics, power output, environment, skill, and subjective scoring to the variability of athletic performance should help identify and evaluate strategies for performance enhancement. We thank Carl Foster for clarification of the dynamics in the winter sport of skeleton and speed skating. Neither author (Rita M. Malcata or Will G. Hopkins) has any conflicts of interest to declare with regard to this publication. No funding was received for the conduct of this study and/or the preparation of this manuscript.